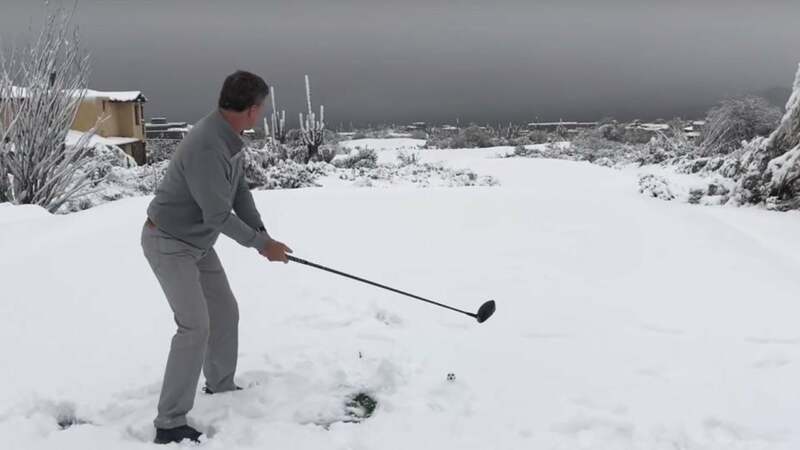 Troon North is just one of several Phoenix area golf courses blanketed by snow. It’s not everyday that you get to see snow in the Phoenix area. But a winter storm slammed the region this past week, as the area saw record-setting snowfall totals. As a result, it left golf courses in the area such as Troon North Golf Club covered in snow. About 15 players came out and tried to play the course last Thursday as the bad weather began, but Troon North closed this past Friday and Saturday as the storm ensued. As a result, about 300 rounds of golf had to be cancelled because of the snow. Golfers could not get back onto the course until this past Sunday afternoon. Fortunately, the course suffered little damage and the water drained quickly off the greens. Only frost kept golfers off the course for the early part of Sunday. While a record-high number of two inches of snow might be nothing to people in other parts of the country, it’s the exception to the rule in the Phoenix area. The snow also led Phoenix to set a new record for its lowest-ever high temperature, as it got no warmer than 47 degrees this past Friday. That broke the previous record of 54 degrees, which was set over 120 years ago. To give some context, the historic average high temperature at this time of year in Phoenix comes in at about 73 degrees, while the average low is about 50 degrees. So it’s safe to say that this hasn’t been the best weather for golfing in the Phoenix area. Imagine this had happened during the Waste Management Phoenix Open last month.